As a follow up to my earlier view on The Apartment, I must admit this movie is one of my all time favorites. 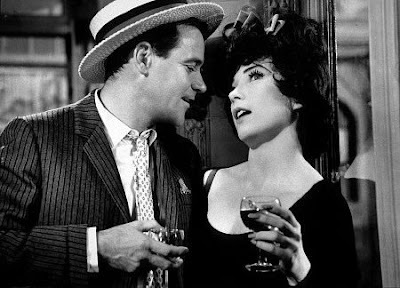 Irma La Douce (Irma the sweetest). 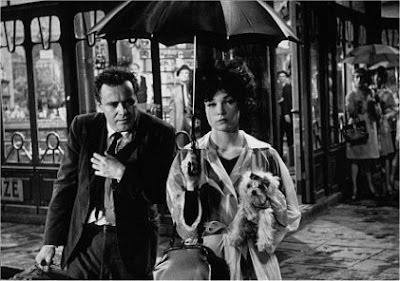 Jack Lemmon is remembered for his portrayal of Nestor Patou, an honest police officer who one day on duty finds a street full of prostitutes in one of the popular areas in Paris. He reports all the ladies to the police station in front of his senior official. Aware of the activities, Nestor finds himself in false charges of bribe and hence thrown out of service by his senior men who indulge in bribes. He becomes close to Chez Moustache (Lou Jacobi), a local bar owner. While he is drunk, bizarre sequence of events ends Pastor being the new pimp boyfriend for Irma as she dumps the previous guy. Pastor moves in with Irma. He is in love with Irma and hence cannot digest the fact of she being with other men, he comes up with a master plan of disguising himself as an old English guy (Lord X). Lord X offers Irma good money so that she can entertain only him. To earn the money, Pastor works for a meat processing industry during the night and early hours, hence most of the time he ends up in bed tired. With time, this upsets Irma and hence she finds solace by talking out her problems with Lord X.
Jealous ensures Irma’s ex-boy friend to kill Lord X. Pastor again becomes a victim. Rest is all about how he manages to escape from prison and how he manages to convince Irma that he loves her more than anyone. 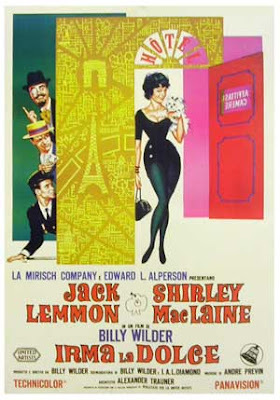 One of the best comedies in Hollywood, Irma La Douce was released in 1963 and was directed by Billy Wilder. One of the fascinating things about Lord X is his strut and his comic timing. His ‘cheeribye’ is very catchy. In a way, I wouldn’t like to describe much about this movie, as I would recommend everyone movie lover to watch and enjoy. Just to add, Marilyn Monroe was touted to play the role of Irma, instead Shirley Maclaine was chosen, as Monroe was dead by the time the production of this film started.